I want to help you by giving a few behind-the-scene insights that one only gets from running a website. I made the following observations by looking over my wife’s shoulder as she manages her fashion forum. Quite frankly, her difficulties put me off running my own forum. To digress slightly, what is the ratio of your genuine emails to spam? 1:3? 1:10? It may surprise you that there is a similar ratio of 1 genuine forum post to 10 spam attempts. What people, or more likely, what robots do is register in forums and then post links to their own sites. Just as your email has a spam filter, so good forums weed out the irrelevant posts and delete the spam registrations. What the spammers are trying to do is make money. It comes down to a numbers game, hence the use of robots. The chance of any one link earning money is slim, but if they can plant say 100,000 links, then 1,000 people will click and 1 will buy. Even if nobody buys, the links enable their sites to rise in the website rankings. The only way my wife retains her sanity, and keeps her forum running, is to have a wry laugh at the names spammers try to register, e.g. robots@xyz, or promotion@abc, also 95% of all .ru addresses are spam attempts. Of those who manage to get through her screening, a common trick is to make a genuine post, get it approved, then go back and change the post so that it links to a promotional site. My reason for telling you this is so that you recognise good forums and appreciate those who keep their posts clear of such distractions. Tough registration systems give us short-term pain, but long-term, you get a more focused forum. Moderation introduces a delay, but it’s worth the wait to know that the spammers cannot clutter the forum with rubbish. microsoft.public. Try searching for ‘microsoft.public.windows forum’ in your browser. Forums are staffed by people with disparate motives, many are true altruists, they enjoy helping people. For others hanging out in a forum is an enjoyable way of learning the product. What matters is that the forum provides us with quick answers. Mostly you know within 2 hrs if you are going to get a worthwhile answer. These answers work best if you treat the reply as putting you on the right track; realize that many posts will need modifying for your particular situation. While you may be lucky and find that someone has already asked, and received an answer to your problem, I recommend that you register in the forum and then post your own question. When you compose your message, give as many details as possible, some forums even allow screenshots. Searching for answers on the internet is somewhat like driving your car on the road, in the sense that nobody admits to being a bad at driving, or bad at searching. Let me break that mould and lead from the front, I will start by pointing out my weaknesses when I try to search the internet. Remember to use the minus sign to exclude sites, such as those with books or ebay, for example ‘troubleshooting vista -books’ or ‘memory sticks -ebay’. I only ever read the first page that the search engine returns. Perhaps I should read the second and third page rather than compose yet another search string. I never use anything but the Google search engine. Logic tells me I would better using MSN or even Yahoo for certain types of query, especially where Google comes up blank. Something that surprised me – plurals produce different results – compare the sites returned by, ‘computers disk’ with those returned by, ‘computer disks’, or ‘Group Policy’, with ‘Group Policies’. I have a theory that most people are not as good at using internet searches as they think they are. The reason for my belief is because every day my website attracts about five requests for help. Now I solve four out of five requests simply by searching in Google. Perhaps I have two killer features, which those asking for help lack – belief and determination. I have faith that the answer to any problem is out there on the internet. Earlier I said that I believe that the internet will solve any problem. Occasionally, this belief is wrong. If it’s a computer problem that neither the internet nor a forum can solve, I thoroughly recommend Microsoft Support. This service will either cost you nothing, or they will explain the charges to you in the range of $250. What follows is purely a personal view. If the problem is caused by a software problem in a Microsoft product then the support staff will fix it for free. For example, reproducible actions in IE7, which result in a bug freezing your machine, However, if the underlying cause is hardware, for example, recovering data after a disk failure then there is likely to be a charge. Whether the service is free or paid for you get dedicated staff with the desire to do what ever it takes to solve your problem. You get the feeling that the tech support staff take ownership of the problem. (Unlike ordinary support staff who want to fob you off as quickly as possible). In my dealings with Microsoft Support, I detect that the staff have been trained in troubleshooting methodology, also a level of customer care, which is almost unknown any where else these days. Naturally all the Microsoft Staff have great technical skill. Now, I am not bad on Windows Server 2003, but my tech support staff took me to places that I did not know existed. They persuaded me to do things that even in my ‘Gung-ho Guy’ moments, I would never normally dare to attempt. The bottom line was they fixed my problems. In summary, you are always allowed to ask for help at the Microsoft Support site. Sometimes you may be amazed what you get if you ask politely. Enter ‘Microsoft Support’ in your favorite search engine. Seek out ‘Contact us’, then just phone on the locale number provided. Discuss your problem and the cost of a solution, if any. Attitude is important. Make sure that you get into the right frame of mind. Do the right thing, if you need to buy a new part, or pay for help, then open up the wallet and part with the cash. However, before you spend time or money, it is vital to ensure that your diagnosis is correct. As an aside, the funniest episode of ‘Fool’s and Horses’ is where Del, Rodney and Granddad repair a chandelier. While Del and Rodney hold one chandelier, Granddad loosens the bolt on a different chandelier. Oops – Crash! The moral, if your computer is overheating, don’t buy a replacement CPU when all you need is a new fan. Guy once had to learn a product quickly. I spent 2 weeks on a structured course followed by ten days of study leave. However, in just two days on the help desk, I truly learnt the product, how people used it and what the real problems were. What I also learnt was that if you ever want a meaningful reference, phone the company’s help desk and ask what they thought of the person you are about to hire, they really know who is nice, who, is naughty, and who is unemployable! 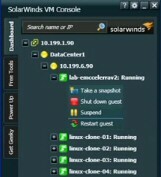 See SolarWinds Web Help Desk.